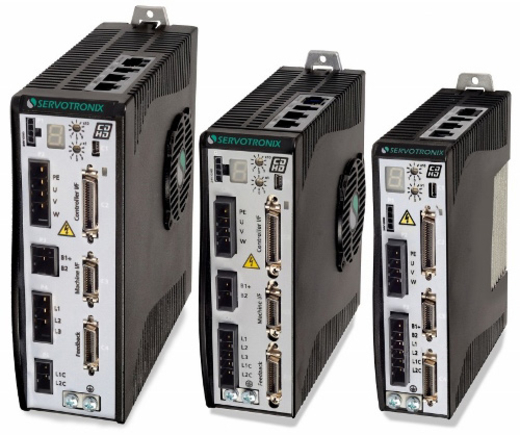 Smartservo is a range of servodrives integrated with the X-Series controllers brought about by a partnership between Horner (IE) and Servotronix (IL). The drives are CiA 402 compliant. THE DRIVES ARE INTEGRATED INTO THE OCS CONTROLLER range via CANopen with ladder blocks to simplify the system setup and control. They are available in sizes from 4,5 A to 48 A peak running from 120 V to 240 V single or three phase or 400 V to 480 V three phase supplies. According to the company, the servo motor drive system CDHD by Servotronix supports any servo motor, any feedback type, and with the X-Series controllers any I/O requirement. It offers commissioning through the Servo-Studio software or direct terminal access, with auto-tuning of current, velocity, and position control loops. The OCS range is intended for example for packaging, labeling, shears, torque control systems (screw drivers, nut running etc.) and robotics. The drives include current loop design, which achieves an industry-leading frequency response of up to 3 kHz. The anti-vibration algorithm eliminates mechanical resonance. Using CANopen or Ethercat, the drives can be synchronized for multi-axis movement. The integrated blocks in the controller allow use of these features. Additionally, the use of a remote encoder input allows a drive to slave to a master motor or shaft.